Spend 5-10 minutes to identify your strengths and uncover hidden gaps and potential vulnerabilities. 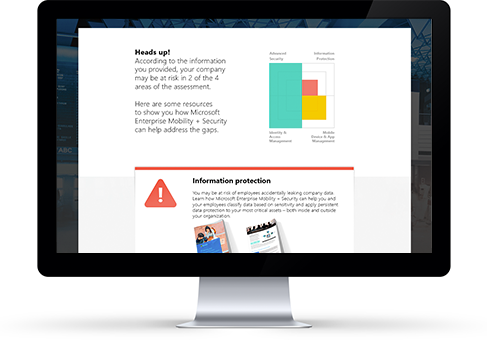 At the end of the assessment you’ll receive a summary report of how your practices compare to today’s most advanced enterprise mobility solutions. You will also have access to in-depth resources that can help you plan next steps and how to address your specific needs. 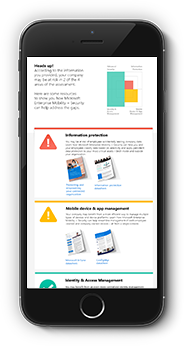 Microsoft may use your contact information to provide updates and special offers about Enterprise Mobility and other Microsoft products and services. You can unsubscribe at any time. To learn more you can read the privacy statement.